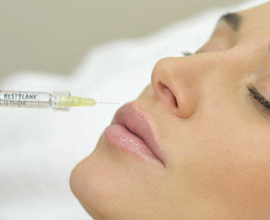 At Beyond MediSpa, all of our injectable procedures are carried out exclusively by our highly experienced Medical Aesthetic Doctors. As part of your treatment, your Doctor will carry out a full Consultation. You will be able to discuss the results you have in mind, enabling your Doctor to assess your expectations and select the optimum procedure and product for your needs. Wrinkle relaxing treatments (Botulinum toxin type A) are available by prescription only. For treating a range of different areas and concerns including ageing lines and wrinkles, such as brow furrows and worry lines, frown lines between the eyebrows and crow's feet radiating from the eye corners. These treatments can also be effective for sharpening and lifting difficult treatment areas like the neck and jaw line. Muscle relaxants can also reduce excessive perspiration (hyperhidrosis) of the underarms and palms. They have also been found to ease headaches and migraines in some patients. Regular wrinkle relaxing treatments are recommended as they have significant advantages over occasional treatments. Regular treatments can result in longer lasting effects, with stubborn lines and wrinkles starting to soften and lesson over time. It takes between one to ten days for the procedure to take full effect and results last for three to four months after your first treatment and up to six to nine months after regular top-up treatments. Wrinkle relaxing treatments are often performed at the same time as dermal fillers or other cosmetic procedures, although in different areas of the face, for an all-over smoothing of wrinkles and facial lines. These treatments are for sculpturing, contouring and defining facial features, such as the cheeks and chin and softening lines, folds and wrinkles and to plump lips. They are also effective for plumping, hydrating and rejuvenating aging skin on the face, neck, décolleté and hands. The fillers used are made from Hyaluronic Acid; a moisture-binding gel-like substance found naturally in the body, which when injected into the skin creates volume for a plumper more revitalised, youthful appearance. Your Doctor will recommend one of the two leading brands of injectable fillers - Juvéderm® and Restylane® - selecting the most suitable for the depth of wrinkles and area to be treated. Results are instant and last for six to nine months.